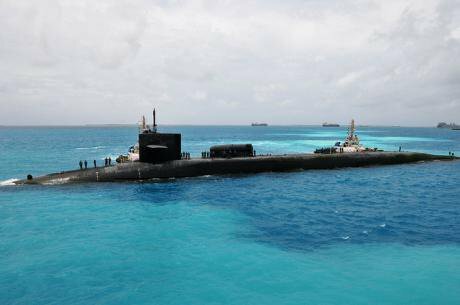 A submarine prepares to moor at Diego Garcia. Flickr/U.S. Navy. Some rights reserved. Diego Garcia is the largest island of the Chagos Archipelago, a collection of tiny specks in the central Indian Ocean that together comprise the British Indian Ocean Territory (BIOT). The history of this outpost of empire – the last ever colony, in fact, to be created by the British Empire – is a dark one, sullied by the mistreatment and dispossession of its indigenous population and, more recently, by suspicion that the territory played host to torture during the Bush-era war on terrorism. Recent events give hope that a new page will be turned. Yet a better future for BIOT is far from assured and critically depends upon hard choices being made by politicians at Westminster. Since the late 1960s, London has made Diego Garcia available to the U.S. for military purposes. Originally a modest communications facility, the American base grew during the late Cold War to become a vital naval installation – one of the clearest and most significant manifestations of the Anglo-American “special relationship” at work. Both the base and the colony of BIOT (which was created purely in order to facilitate unfettered U.S. access to Diego Garcia) have been caked in controversy ever since their establishment. When Diego Garcia was first earmarked as a potential site for an Indian Ocean base, the island and the rest of the Chagos Archipelago were integral parts of the then-British colony of Mauritius. Britain and the United States worried that, once Mauritius became independent, any military base on Diego Garcia would be placed in jeopardy. As such, in 1965 London excised the entire Chagos Archipelago from Mauritius and reorganised the islands into the new colony of BIOT – an imperial act that Port Louis today argues to have been illegal under international law, and which forms the basis of a Mauritian claim to sovereignty over the islands. Shortly afterwards, Whitehall deployed its unrestricted powers in the territory to forcibly displace the several thousand indigenous islanders who called Chagos home. Then numbering around 1,500, the Chagos Islanders were the descendants of slaves, indentured labourers and migrant workers from Africa and India—a distinct society forged out of centuries of colonial rule. Yet a permanent civilian population did not chime with the Anglo-Americans’ intentions for BIOT to become a purely military outpost, and so Britain undertook the forced expulsion of the islanders beginning around 1967. By 1973, the whole archipelago had been cleansed of its former residents. BIOT was officially void of a permanent population. The exiled Chagossians (many of whom were granted British passports in 2002) were forced to lobby for a right to return to Chagos from afar. In the 1970s and 1980s, the expansion of the base on Diego Garcia was opposed by many states of the Indian Ocean littoral, the leaders of which charged that the militarisation of the island ran counter to the region’s professed desire for a “zone of peace.” The U.S. military presence on Diego Garcia risked provoking a naval arms race with the Soviet Union, they argued, making the Indian Ocean a theatre of the Cold War when most countries of the region wanted nothing more than to escape entanglement in the superpowers’ epic rivalry. Neither the U.S. nor Britain backed down, and in the 1990s and 2000s Diego Garcia’s awesome military value was laid bare when the territory was used as an invaluable staging post for U.S.-led military action against Iraq, Afghanistan and Iraq again. Throughout it all, the British government afforded the United States carte blanche in BIOT. London’s minimal supervision of U.S. activities on Diego Garcia contrasted with its vigorous approach to opposing the Chagossians’ bid for resettlement and Mauritius’s claims of sovereignty. A division of labour emerged: Britain would maintain the political security of the base while the U.S. took care of actually running affairs on the island. After 2001, allegations that Diego Garcia was being used as a node in the CIA’s system of extraordinary rendition and torture were brushed aside by the Labour government—until 2008, that is, when Foreign Secretary David Miliband was forced to admit to Parliament that two rendition flights had, in fact, stopped in Diego Garcia to re-fuel. The true of extent of Diego Garcia’s role in rendition and torture is still not known to the general public. The recently published – albeit heavily redacted – Senate Intelligence Committee report into the subject contained no mention of the secretive base, which sceptics argue reveals more about British officials’ eager lobbying of their U.S. counterparts than it does about Diego Garcia’s actual role in the torture program. Even so, clues as to the territory’s recent history abound: the United Nations, Council of Europe and Reprieve all argue that Diego Garcia constituted a “black site” in the so-called war on terrorism. Last month, more evidence emerged. Colin Powell’s former chief of staff admitted that Diego Garcia was used as a location for the interrogation of terrorist suspects – the first high-ranking Bush administration official to do so. It is only a short leap to conclude that the island was the scene of infamous “enhanced” interrogation techniques. The “black site” appellation seems to be justified. At the very least, the latest revelations undermine previous British assurances that Diego Garcia was only ever used as a re-fueling stop on two occasions. What is the truth? Did British ministers mislead Parliament and the public, or did the U.S. mislead the British government? Either way, a web of deceit is brought into focus. The dark history of Diego Garcia is slowly coming to light. Today, there is something that the British government can do to hasten this process: let the indigenous people of Chagos return to their homes. Despite over four decades in exile, the Chagossians have never given up their claim to a right of abode in BIOT. They even won a legal right to return in 2000, only to have it overturned four years later by the Blair government. This week, the consultancy firm KPMG completed a long-awaited study into the feasibility of resettling Chagos. The conclusion of the study is that resettlement is possible, and indeed could be undertaken in several different ways. KPMG’s findings directly contradict an FCO-commissioned from 2002, which found resettlement to be impracticable, and which since has been marred by accusations of politically-inspired manipulation. For a long time, the government opposed the Chagossians’ bid to return and manufactured the narrative that resettling the islands was impossible. This never washed with the Chagossians or their supporters. After all, how could BIOT be uninhabitable when thousands of U.S. military personnel and support workers lived there on a continual basis? Now, KPMG have left the government’s erstwhile position in tatters. Allowing the resettlement of Chagos is the right thing to do. As governments of both parties have admitted, the initial expulsion of the Chagossians was a heinous thing to do – morally reprehensible even if held to be technically lawful by the Law Lords in 2008. Righting this historic wrong, then, is something of a “no brainer” now that resettlement has been found to be feasible and practicable. Yet returning the Chagossians to Chagos also makes strategic sense for those in London – especially parliamentarians – who are concerned about Britain’s recent history in Diego Garcia. Part of the problem with Diego Garcia is that the island has operated as a “legal black hole” in the middle of the Indian Ocean, a jurisdiction to which hardly any pieces of legislation have been extended. With no British presence other than a token detail of marines (the administrator of the territory is a technocrat based in Whitehall), the U.S. military has been allowed to act as it sees fit, far away from prying eyes. A permanent civilian – British – population on Diego Garcia or any of the other Chagos Islands would overhaul this dark and secretive state of affairs. New governmental structures could be put in place, legislation – including human rights legislation – could be extended to the territory, and effective British oversight of Diego Garcia could be restored. Civil-military relations could be rebalanced. Chagos could once again become a de facto British space as well as a de jure relic of empire. As the country reflects upon 800 years since the signing of Magna Carta, a restoration of the rule of law on Diego Garcia would be a fitting tribute. Britain has a shameful record in the Chagos Islands. Empire, slavery, expulsion, secrecy and militarism have been the watchwords of this distant land. Yet with the government supposedly reviewing its policy towards the resettlement of BIOT in light of KPMG’s findings, a unique chance to influence the fate of the territory exists. Those outraged by the manner in which U.S. military and British government officials have evaded oversight in Chagos – human rights groups and numerous MPs and peers among them – ought to grasp this moment to alter the political landscape in BIOT in decisive fashion. Resettlement offers a promising way out of a dark corner. The opportunity must not be allowed to pass.